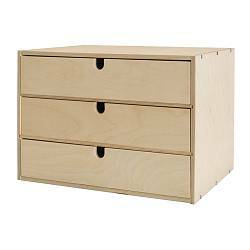 I spent some time this weekend putting together this little chest of drawers from Ikea. It isn't hard, but it isn't easy either and it is't quiet. Lots of nailing, lots. Anyway, I wanted it for my my work table in the craft den. Once it was together I set about painting it. I just used acrylic paints that I already had, not the paint they sell at Ikea for this purpose. I chose turquoise, which is an odd choice if you know me, but for some reason I like it in room decor and it would match my curtains. 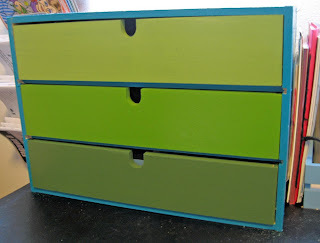 I wanted to do three colors for the drawers in different shades of green. I had to mix one to make it work, but it turned out how I imagined it, which is always nice. I really like the combo of turquoise and avocado green. It was used a lot on the early 70's and I think it is due for a comeback. After the paint, I put on a light coat of Mod Podge. I chose glossy and should have chosen matte. After I did it I remembered that glossy always seems to stay a little sticky, whereas matte doesn't seem to. But, it seems okay. Here you can see it a little with the curtains. This little chest of drawers will soon have stuff piled up on top of it, I am sure. But, for a little while I get to see it like this.